The past two decades have witnessed a significant increase in the level of worldwide maritime piracy. With more than 50 percent of all contemporary maritime attacks attributed to Somali pirates, no other region is capable of generating more piracy-related investigations and analysis. Unfortunately, as the proliferation and success of Somali pirates continues, the organizational sophistication of pirate gangs will also increase, and the problem will spread to other areas with similarly enabling factors. Somali pirates are models for other prospective pirates to emulate. Yet they also provide case studies into how shipping companies and the international community can work to address the piracy problem. Against this background, this analysis moves beyond discussing the root cause of Somali piracy and breaks down the anatomy of attacks, looking at the possible successes and failures at different stages of the process. However, with high rewards and low risks for the pirates, the struggle to reduce piracy may be an uphill battle. The majority of piracy attacks take place within the jurisdiction of a state, but the UN definition restricts the ability of law enforcement to take action within territorial waters.3 Pirates are therefore able to evade capture by sailing from the high seas into the territorial seas of a state with little means to combat maritime crime, putting themselves out of reach of domestic and international law.4 The International Maritime Organization (IMO) attempted to address this problem by defining “armed robbery at sea” as acts of piracy that are committed within a state’s territorial waters. The entrance of foreign navies into a state’s jurisdiction is understandably not always welcome as it challenges sovereignty. This provides pirates with an additional layer of protection from capture and prosecution. It should be noted that piracy, as defined by UNCLOS, does not include ”public” or “political” acts, and thus excludes terrorists and insurgents. Determining an accurate account of piracy presents a significant problem insomuch as the majority of accounts rely on self-reporting. Kidnapping victims might be intimidated into silence and shipping companies might be reluctant to make reports that could damage their reputation, increase crews’ demands for additional payment, and cause a ship’s delay during the investigation.5 Extensive records of pirate attacks do not exist prior to the early 1990s making it difficult to analyze long-term trends. What is possible, however, is to examine the speed at which the Somali pirate problem has increased, making the region the world’s hotspot for piracy within a relatively short period of time. This is illustrated in table 1. 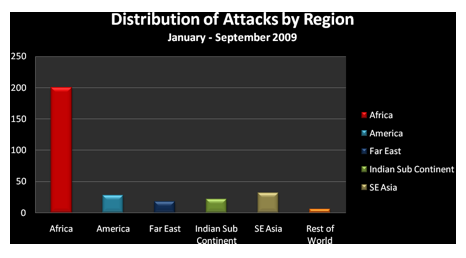 Table 3, showing attacks from the beginning of 2009, demonstrates the high concentration of attempted attacks in the Gulf of Aden, as well as the distance from the coast that pirates are willing to travel. Overfishing and toxic waste dumping by foreign entities has fuelled Somali motivation for maritime attacks. For most, the primary incentive is profit; however a great number also view their work as protecting the waters from thieves. This encourages a certain level of cultural acceptability, creating a more permissive environment for piracy to flourish. 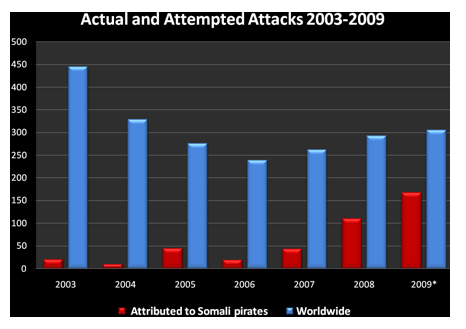 According to the Africa Faith and Justice Network, seventy percent of Somalis support piracy as a method of national defense.15 The influx of ransom cash into the impoverished region also adds to public support for piracy, – although even without public support, the country’s inadequate law enforcement would be unable to substantially reduce attacks. In 2008, Somalia scored thirty-five on the Global Integrity Report, the lowest score in the history of the report.16 The poor score can be attributed to the fact that law enforcement agencies do not receive regular funding because the country does not have sufficient financial reserves. In 2006, the Islamic Courts Union (ICU) established control after the warlords’ rule collapsed. This created a temporary setback for the pirates who had been operating under the protection, perhaps even direction, of the warlords. Later the same year, however, the US-backed Ethiopian forces overthrew the ICU amid concerns that they were harboring Islamist extremists.17 Not long afterwards, pirate activity resumed and has continued to increase since then (see Table 1). Somalia’s piracy can be seen as a crossbreed of opportunistic attacks, which amount to little more than armed robbery, and more organized and well-resourced hijacking. The latter comprises a much smaller portion of total attacks, but demonstrates how funding and intelligence can escalate the risk of violence and increase the potential for profit. The increased level of hostage taking can also be seen as evidence that piracy is becoming more sophisticated. Based on a system of categorization that looks at piracy’s form, it is also possible to describe the evolution of Somali piracy from an episodic phenomenon, which flourished “at specific moments as the result of the weakening of imperial or state power and the consequent distortion in trading patterns” to something that has become intrinsic. 20 The intrinsic form of piracy exists where piracy is a component part of a society’s fiscal or commercial life. This form of piracy applies to Somalia where the pirates are investing large sums of ransom money into their impoverished communities and steadily gaining support. IV. THE ANATOMY OF AN ATTACK The following steps represent the process by which Somali pirates organize and attack their targets, the subsequent negotiation process and the ways in which the profits are obtained and distributed. Step 1: Recruiting As discussed earlier, the systemic problems currently facing Somalia create powerful motives for piracy and make it easy to recruit young men into organized crime. Such individuals grow up in an environment of perpetual conflict between warlords and an ineffective government. Furthermore, educational and economic opportunities are severely limited to the point of being non-existent. If there are any opportunities for income, they are likely illegal. The majority of pirates come from Puntland, a semi-autonomous region in the far east of Somalia.25 Constituting over one third of Somalia’s coastline, the region traditionally depended on its fishing industry.26 The southern city of Merca, a well-established port city close to Mogadishu, has also become a haven for piracy. Both Puntland and Merca are prime recruiting areas because of the traditional fishing economy and safe harbors. Step 2: Creating the Network The debate regarding Somali pirates is polarized over the degree of organization involved. One interpretation is that piracy is a crime of opportunity, operated with little organization and no need for a real network. The second points to a highly organized, well-informed international network. While there is evidence to support each interpretation, it is likely that the majority of successful pirate attacks fall somewhere in between the extremes. Pirate groups, or ‘gangs,’ as they are often labeled by the media, number between four or five. On a very basic level, groups can range from loosely organized, to something much more militaristic. The Merca group is composed of various small pirate gangs located around the southern city of Merca. Reportedly, Sheikh Yusuf Mohamed Siad, a well-known warlord and Security Chief of the Islamic Courts Council, commands the group.31 Similarly, the Puntland group is composed of traditional fishermen who operate along the coasts of their home region. 32 These two groups suggest that organized piracy has developed naturally as the number of participants increase and has done so without a sophisticated command and control structure. There are also fears that piracy finds support from Islamic extremists groups. While there is clear evidence to support direct ties between piracy and the Islamic Courts Council through the leadership of Sheikh Yusuf Mohamed Siad, there is little evidence to suggest that extremist networks such as al-Shabaab fund piracy. Rather, as discussed below, there is more evidence to suggest that piracy supports religious extremist groups. Most likely, the reality of the piracy network rests somewhere in between the two contrasting assessments. The use of GPS devices and cell phones suggests a level of sophistication beyond simple opportunism. Furthermore, the use of international informants is also very likely. However, informants are more likely to be everyday dockworkers and associates camped along the Suez Canal rather than industrial spies from shipping companies. Finally, while there is evidence of financiers and clear chains of command, reports on support from expatriates or religious extremists have not been fully substantiated. The equipment needed to participate in piracy is relatively limited, but not insignificant. First, pirates require boats. While this is obvious, the size and power of the boats reflect the particular needs of Somali pirates. Originally, most pirates used small motorboats and attacked ships that sailed relatively close to the shore. As the desire to capture more profitable and larger ships increased, so did the transportation needs of the pirates. Mother ships are used to extend the pirates’ attack areas. They are typically large captured fishing boats. For example, in April 2009, an Egyptian fishing vessel was captured in the Gulf of Aden. The pirates failed to demand a ransom, indicating the possibility that the vessel became a new mother ship.40 Typically, the ship’s crew also remains onboard, serving as both hostages and human shields. These larger boats are capable of going much farther from the coasts and can offer support to the smaller skiffs. Skiffs, or small boats equipped with powerful engines, are more commonly used in the actual assault. They are fast and can easily pull along close to their targets. Step 4: Choosing a Target Somali pirates have attacked every type of vessel crossing through the Gulf of Aden and Indian Ocean. According to a report by the ICC International Maritime Bureau “bulk carriers, containers, fishing vessels, RoRos, tankers, tugs, and yachts have all been targeted by the Somali pirates.”49 While they frequently strike fishing boats, attacks against private yachts, cargo ships, and oil tankers get the majority of international attention. Like the Egyptian vessel captured in April 2009, fishing boats are tempting targets since they can be used for further acts of piracy. The larger vessels, while much more lucrative for the pirates, are also far more difficult and risky to capture. During an attack the pirates typically surround the vessel and begin firing their RPGs and small arms. One report in 2009 suggested that a recent decrease in the number of successful attacks by pirates has lead to “desperate” and “indiscriminate” shooting of weapons in the hope of “intimidating” the captains.54 As the violence increases, pirates have taken to targeting the bridge and crew quarters, shooting out windows or firing their RPGs.55 While they want to create enough fear in the crew to force them to stop, the pirates do not risk damaging the potential hostage. If the attack is successful, the pirates board the ship and secure the crew. Once the target ship stops, one pirate will scale the side of the vessel using ladders or a rope and grappling hook.56 After he is onboard, the pirate lowers more ladders for the rest to climb and they secure their skiffs alongside the now hijacked ship. After all of the pirates are aboard, the ship’s crew is confined together in one area of the vessel. The captain, on the other hand is kept on the bridge and in control of operating the ship. Once all the hostages are secure, the ship is moved to a pirate friendly port in Somalia or simply nearer to the coast.57 Eyl, a coastal city in the southeast region of Puntland, is one of the most heavily used, pirate friendly ports.58 After the ship reaches a safer area, more pirates are brought onboard. Not all attacks are successful. Of the 147 attacks reported as of October for the 2009 year, only 32 actually resulted in the hijacking of the target.59 Captains of ships traveling in known pirate waters are advised to keep “twenty-four hour visual and radar watch.”60 Early detection of pirates allows the ship more time to utilize evasive actions and gives international navies time to intercept the attack. Ships will attempt to use speed and weapons onboard to escape the pirates. Once an attacked vessel sends out a distress signal, small war ships from one of the multiple navies stationed in the area rush to the ship’s assistance. If they can reach the vessel in time, they will intercept the pirates and take them into custody. If the ship is already hijacked, the navies will follow the captured vessel at a close distance. Less frequently, crewmembers of the hijacked ship attack the pirates as they attempt to climb up the sides or once they are onboard. One of the few examples of this occurred on the Maersk Alabama. Members of the crew captured one of the pirates and barricaded themselves in the engine room. As the international navies approached the ship, the pirates fled with the Alabama’s captain. While resistance might provide enough time for military support to arrive or even repel an attack, it also gives the pirates a reason to use lethal force. Some attempts to repel the pirates have led to the injury or death of crewmembers. The attacking pirates are rarely involved in the negotiation process, typically hiring a middleman instead.62 The middleman is usually highly trusted by the group, is perhaps even a family member, and can speak English. The pirates use the information onboard the hijacked ship to contact its owners and sometimes contact the media in hopes of exerting more pressure on the shipping company.63 As another pressure mechanism, the pirates allow the ship’s crewmembers to contact their families then fire their guns to incite fear in the hostages and their relatives. During the negotiations the pirates usually take excellent care of both the crew and the ship. They recognize the value of their hostages decreases if any members of the crew are killed or if the vessel becomes useless.68 Other reports suggest the pirates refrain from killing any hostages because of moral and religious ethics.69 However, so far the pirates have been very successful in receiving ransoms. If they begin to kill hostages or damage the captured ships, companies may turn to private or international militaries to take back vessels by force. Step 7: Receiving the Ransom Not all negotiations end in the delivery of a ransom. In rare cases military interventions rescue the hijacked ship and hostages. In April 2009 the French military attempted to rescue a family, including a child, being held onboard a yacht. It was feared the family would be taken on land if negotiations lasted very long. During the rescue mission two of the pirates and one of the hostages were killed.71 In the case of the Maersk Alabama, the U.S. Navy rescued Captain Phillips after shooting all but one of the pirates. However, most shipping companies do not want military interference for fear of putting the crew and ship at a greater risk. In most cases military interventions are not utilized after completed negotiations. Around ten per cent of the ransom is given to the ground militia. These are the men on land who protect the ports or any important towns used by the pirates. The majority of hostages remain onboard their ships, but in some cases hostages are brought ashore to be guarded. Another ten percent is given to the local community. Most of the time, this refers to religious leaders, but is also used to improve infrastructure and keep the community pirate friendly. Twenty percent is paid to the financiers of the pirates. This includes paying local businesses that give the pirates supplies during the negotiating process and any community members invested in the group. The last thirty percent is given to the pirates’ sponsors. While there is little concrete evidence of specifically who sponsors pirate groups, it is clear that many piracy missions are financed with seed money from an outside source. One report claimed it cost $30,000 USD for each attempted hijacking and that pirates are usually only successful 1 in 4 times.78 However, if a hijacking proves successful, the sponsor could receive around $900,000 USD from a 3 million dollar ransom. Providing a portion of the ransom to religious extremist organizations is another possible, though unsubstantiated, use of the piracy money. Tensions between the pirates and al-Shabaab insurgents have not created a perfectly symbiotic relationship. Some reports suggest that up to 50 per cent of ransom payouts are given to al-Shabaab.85 However, an equal number of reports relate incidents of violence between the organizations. In 2008, after pirates hijacked the Saudi supertanker Sirius Star, Islamic militants retaliated by attacking the pirate port of Haradheere.86 The group disapproved of the pirates’ attack of a Muslim owned ship. Similarly, al-Shabaab reportedly became angry when pirates did not agree to hand over the weapons shipment from the captured Ukrainian ship in 2008.87 While some of the ransom money might be turned over to religious extremist organizations, it is most likely not by the pirates’ choice. As concerns about the level of Somali attacks have increased, international organizations have made efforts to address the issue In December 2008, the UN Security Council unanimously passed a resolution to allow states and regional organizations the power to use “all necessary means” to fight piracy off the coast of Somalia.88 Granted with the approval of the Somali Transitional Federal Government, the resolution allows states and regional organizations to enter Somalia’s territorial waters and use means such as naval vessels and military aircraft, to seize and dispose of boats and related piracy equipment.89 Originally created with a twelve month time frame, the success of this approach led to the renewal of the resolution for a second twelve month term. Though generally viewed as a success, the resolution has also raised concerns about the use of military force to combat a civilian problem. The United States, in addition to increasing intelligence sharing and patrols, has encouraged all countries to adopt a policy of no concessions when dealing with pirates. As such, when Captain Richard Phillips of the Maersk Alabama was held hostage, the US government refused to negotiate with the captors and instead made one of its few direct rescues. The sole surviving pirate from the attack, Abdiwali Abdiqadir Muse, is currently being held in the United States awaiting trial, making him the first person to be tried for piracy in the US since 1885.95 Proceeding with the case has been difficult, as lawyers have struggled to confirm whether or not he is a minor and to identify the extent to which he played a role in the attack. Varying Responses Although there has been a certain level of international cooperation, the fact remains that different governments have varying approaches in their responses to piracy. While the United States government holds firm in its decision not to pay ransom to pirates, the Spanish government has reportedly paid money for the release of hostages. It is alleged that the Spanish government paid more than $1 million USD for the release of a Spanish trawler and 26 crew members who had been captured by Somali pirates in April 2008. Again, in November 2009 the Spanish government reportedly paid more than $3 million USD for the release of 36 crew members who had been held hostage for six weeks.96 These actions by the Spanish government are not only contrary to the policy of most Western countries, but greatly undermine efforts to combat piracy. Paying the pirates any part of their demanded ransom essentially reinforces their motivation to undertake further attacks. As more pirates come home with large sums of money, the idea of piracy becomes a more attractive and viable option for others. As the problem of piracy grows, new security companies are emerging, claiming to be experts on piracy. These remain basically unregulated and might not be adequately trained or effective. The idea to arm shipping company crews incited a storm of controversy: not only does such action increase the likelihood of violence in the event of an attack, but it also increases the danger that cargos with dangerous chemicals could explode, causing environmental disasters and accidental deaths. Additionally, arming crews increases the possibility of an arms race with the pirates who would likely increase the quantity or strength of the arms they carry in response. Shipping companies who arm their crews or use security guards also incur increased costs. In order to circumvent these risks, some shipping companies are using non-deadly tactics to deter pirates. The use of floodlights at night is an inexpensive tactic that can help give the appearance of being on anti-piracy watch. Fire hoses are also a low-cost, non-lethal weapon that can be used to spray pirates off of their ladders and prevent them from boarding. Long Range Acoustic Devices, or sound cannons, can be used to emit loud sounds to ward off attackers, although these are more costly. Electric fences, remote control hoses, and tracking devices are just a few of the other options available to shipping companies. Ultimately, shipping companies will not always be able to prevent pirate attacks and some prefer to take their chances rather than investing heavily in counter-piracy measures. Depending on the vessel and the cargo, it might be simpler and less expensive for a shipping company to go about business as normal, paying out ransoms when necessary rather than to change routes, hire security personnel, arm the crew, or buy non-deadly weapons. But as previously noted, piracy will continue for as long as ransoms are being paid. To a degree, Somali pirates can be viewed merely as nuisance fishermen but the potential for increased piracy and related security risks calls for continued attention to the piracy problem. The year-by-year increase in the number of pirate attacks indicates that the escalated efforts by the international community are not having the hoped for deterrent effect. Similarly, the increase in the number of hostages taken suggests that the pirates are becoming increasingly organized and have gained capital. This idea is supported by the fact that pirates continue to expand their attack zones farther out to sea, increasing their reliance on external resources, such as fuel and a mother ship. Major criminal hijacking is typically well-resourced with smoothly run operations. The legal and practical difficulties that law enforcement faces in the pursuit of pirates have created a low risk/high reward opportunity for a group of people with few economic possibilities, a situation that will continue as long as the international community remains unable to work collectively to counter piracy. Shipping companies, and at times governments, inadvertently encourage pirate activity through the payment of ransoms. Although this appears to be an appropriate short-term strategy to ensure the safety of crew and cargo, in the long run this strategy adds fuel to the fire. The continued success of piracy due to payments of ransom creates a number of security risks. First, it increases the danger that piracy will spread to other regions where conflict and disorder are rampant, geography is favorable, there is jurisdictional weakness, and cultural acceptability. For example, Nigeria fulfils most of these requirements and reports of piracy off West Africa are beginning to rise. Piracy might not cause weak states, but pirates certainly exacerbate the problem. The challenges that law enforcement faces in dealing with piracy has led to the use of potentially dangerous methods by shipping companies. Crews that are armed to defend the ship from attack put themselves at great risk, but also increase the likelihood of an arms race. As the strength of weapons increases, the possibility of explosions and environmental disasters increase as well. Piracy is clearly defined as illegal in international law and Somali piracy represents an international, as well as regional problem. The transnational nature of the crime, as well as the involvement of transnational networks, indicates that a unified approach from the international community is necessary. Key players, such as the UN and NATO, have taken steps in creating an orchestrated international response, but as long as pirates are able to extract ransom payments from their captives and face little risk of capture themselves, Somali piracy will continue to thrive. IMB Quarter 3 Report, 2009. Martin Murphy, Contemporary Piracy and Maritime Terrrorism. International Institute for Strategic Studies. (New York: Routledge, 2007). “Global pirate attacks more frequent, violent: IMB report” Business Times. Friday, December 18, 2009. “Admiral: Sea too big to stop all pirate attacks” Associated Press. December 1, 2009 http://www.msnbc.msn.com/id/34224712/ns/world_news-africa/. Paul I. Adujie, “Somalia Pirates are Merely Resisting Toxic Nuclear Wastes Dumping and Over Fishing,” http://www.nigeriaviallgesquare.com October 2009. World Food Program, 2009. http://www.wfp.org/countries/Somalia. Jonathan Clayton “ Somalia’s Secret Dumps of Toxic Waste Washed Ashore by Tsunami” Times Online. March 4, 2005. http://www.timesonline.co.uk/tol/news/world/article418665.ece. “Evaluating the Somali ‘Pirate’ Situation” Africa Faith and Justice Network. April 14, 2009. “What’s going on with Ecuador’s Police?” Global Integrity Commons. April 30, 2009. http://commons.globalintegrity.org/2009/04/whats-going-on-with-ecuadors-police.html. Rob Crilly “Pirates help fund Somali Warlords” Christian Science Monitor. August 27, 2008. http://www.csmonitor.com/World/Africa/2008/0827/p06s01-woaf.html. Catherine Philp, “Captured Somali pirates are being dumped in Kenya, officials say” The Times http://www.timesonline.co.uk/tol/news/world/africa/article6481947.ece June 12, 2009. Robyn Hunter, “Somali Pirates Living the High Life,” BBC News, October 28, 2008, www.news.bbc.co.uk/2/hi.africa/7650415.stm. Accessed December 10, 2009. 2 “Somalia,” The World Factbook 2009, (Washington, DC: Central Intelligence Agency, 2009). Benjamin Weiser, “Somali Piracy Suspect Pleads Not Guilty,” The New York Times, May 21,2009, http://cityroom.blogs.nytimes.com/2009/05/21/somali-piracy-suspect-pleads-not-guilty. Documents in Somalia and Sudan. Norway: Landinfo: Country of Origin Information Centre, 2009. “State Profile,” Puntland State of Somalia, http://www.puntlandgovt.com/profile.php. Mohamed Olad Hassan, “It’s a Pirate’s Life for Me: Interview with Dahir Mohamed Hayeysi” BBC News, April 22, 2009. http://news.bbc.co.uk/2/hi/africa/8010061.stm. Scott Baldauf, “Who are Somalia’s Pirates?” The Christian Science Monitor, November 20, 2008, http://www.csmonitor.com/World/Africa/2008/1120/p25s22-woaf.html. “Pirates,” GlobalSecurity.org, http://www.globalsecurity.org/military/world/para/pirates.htm. See also “Fact Sheet for Supreme Islamic Courts Council,” Silobreaker, http://www.silobreaker.com/fact-sheet-for-supreme-islamic-courts-council-5_2259174231411523584_4. “Somalia: Pirate group threatens new measures,” Somalinet, January, 26, 2006. http://somalinet.com/news/world/English/1676. “Media Attention Dramatizes Somali Piracy,” Naval History and Heritage Command Public Affairs, December 7, 2009, http://www.navy.mil/search/display.asp?story_id=50039. Giles Tremlett, “Somali Pirates Guided by London Intelligence Team, Report Says,” The Guardian, May 11, 2009, http://www.guardian.co.uk/world/2009/may/11/somali-pirates-london-intelligence. “Somali Pirates Get Help from Expats in Canada,” The Star, December 11, 2008, http://www.thestar.com/News/World/article/552023. .
John Lichfield, “Yacht Raid Reveals Hi-Tech Somali Pirate Network,” The Independent, April 10, 2008, http://www.independent.co.uk/news/world/africa/yacht-raid-reveals-hitech-somali-pirate-network-807022.html?r=RSS. ICC International Maritime Bureau 2009, p 32. “British Ship Hijacked by Somali Overnight, As Attack on Norwegian Vessle is Thwarted,” The Daily Mail, May 2, 2009, http://www.dailymail.co.uk/news/worldnews/article-1176594/British-ship-hijacked-Somali-pirates.html. Jeffrey Gettleman, “Somalia,” The New York Times, September 17, 2009, http://topics.nytimes.com/top/news/international/countriesandterritories/somalia/index.html. Sam Jones and Chris McGreal, “Somali Pirates Release Ukranian Arms Ship,” The Guardian, February 6, 2009, http://www.guardian.co.uk/world/2009/feb/05/somali-pirates-free-military-ship. Daniel Wallis, “Somali Sea Gangs Lure Investors at Piracy Lair,” Reuters, December 1, 2009, http://www.reuters.com/article/idUSTRE5B01Z920091201?sp=true. Noah Schachtman, “Exclusive Interview: Pirate on When to Negotiate, Kill the Hostages,” Wired.Com, July 28, 2009, http://www.wired.com/dangerroom/2009/07/exclusive-interview-pirate-on-when-to-negotiate-kill-hostages. ICC International Maritime Bureau 2009, p 25. ICC International Maritime Bureau 2009, p 36. ICC International Maritime Bureau 2009, p 23. Joe Capua, “Somalia – Security: Somali Pirates Target New Area, Adopt Tougher Tactics for Hijackings,” International News Safety Institute, August 4, 2009, http://www.newssafety.org/index.php?view=article&catid=41%3Asomalia-security&id=12657%3Asomali-pirates-target-new-area-adopt-tougher-tactics-for-hijackings&option=com_content&Itemid=100249. Rob Walker, “Inside Story of Somali Pirate Attack” BBC News, June 4, 2009. http://news.bbc.co.uk/2/hi/africa/8080098.stm. ICC International Maritime Bureau 2009. “Q&A: Somali Piracy,” BBC News, November 2, 2009, http://news.bbc.co.uk/2/hi/africa/7734985.stm. Robyn Walker, “How do you pay a pirate’s ransom?” BBC News, December 3,2008, http://news.bbc.co.uk/2/hi/africa/7752813.stm. Brian Baxter, “Seward & Kissel Lawyers Help Negotiate Deal with Somali Pirates,” Law.Com, February 10,2009, http://www.law.com/jsp/law/international/LawArticleIntl.jsp?id=1202428124737. “They Know It’s a Successful Business Model” Spiegel Online, April 21, 2009, http://www.spiegel.de/international/world/0,1518,620292,00.html. “Somali Pirates Live the Good Life” CBS News, November 19, 2008, http://www.cbsnews.com/stories/2008/11/19/world/main4616998.shtml. Mary Harper, “Chasing the Somali Piracy Money Trail,” BBC News, May 24, 2009, http://news.bbc.co.uk/2/hi/africa/8061535.stm. Kihuro, Macharia, “Stand Up Against money Laundering,” Business Daily, December 3, 2009. Opinion & Analysis section, Online edition. United Nations Security Council, Resolution 1846 (2008). North Atlantic Treaty Organization. April 2, 2009, http://www.nato.int/issues/allied-provider/index.html. National Security Council released the National Strategy for Countering Piracy off the Horn of Africa: Partnership and Action Plan, 2008. “New Counter-Piracy Task Force Developed” United States Navy January 8, 2009, http://www.navy.mil/Search/display.asp?story_id=41687. Mail Foreign Service. November 18, 2009. http://www.dailymail.co.uk/news/worldnews/article-1228691/Spain-pays-2m-ransom-pirates-release-36-hostages.html. Christopher Dickey “ How to Deal” Newsweek. April 15, 2009, http://www.newsweek.com/id/194049. Joan Goodchild, “How Shipping Companies can Fight Pirates” CSO Security and Risk December 7, 2008. Jennifer Lawinski “Enemies of All Mankind: Who Can Stop the Pirates?” Fox News April 9, 2009, http://www.foxnews.com/story/0,2933,513957,00.html. Mohamed Ahmed “Somali Sea Gangs Lure Investors at Private Lair” Reuters December 1, 2009, http://www.reuters.com/article/idUSGEE5AS0EV. Adujie, Paul, I.“Somalia Pirates are Merely Resisting Toxic Nuclear Wastes Dumping and Over Fishing,” October, 2009. http://www.nigeriaviallgesquare.com (accessed December 11, 2009). “Admiral: Sea too big to stop all pirate attacks.” Associated Press, December 1, 2009 http://www.msnbc.msn.com/id/34224712/ns/world_news-africa/ (accessed December 15, 2009). Ahmed, Mohamed. “Somali Sea Gangs Lure Investors at Private Lair” Reuters December 1, 2009. http://www.reuters.com/article/idUSGEE5AS0EV (accessed December 18, 2009). Baldauf, Scott. 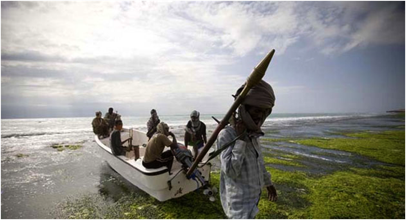 “Who are Somalia’s Pirates?” The Christian Science Monitor, November 20, 2008, http://www.csmonitor.com/World/Africa/2008/1120/p25s22-woaf.html (accessed December 10, 2009). Baxter, Brian. “Seward & Kissel Lawyers Help Negotiate Deal with Somali Pirates,” Law.Com, February 10,2009, http://www.law.com/jsp/law/international/LawArticleIntl.jsp?id=1202428124737 (accessed December 10, 2009). “British Ship Hijacked by Somali Overnight, As Attack on Norwegian Vessle is Thwarted,” The Daily Mail, May 2, 2009. http://www.dailymail.co.uk/news/worldnews/article-1176594/British-ship-hijacked-Somali-pirates.html (accessed December 10, 2009). Butcher, Tim.“Somali Piracy: Islamic Militants ‘Attack’ Pirates Over Hijacked Saudi Tanker,” The Telegraph, November 21, 2008, http://www.telegraph.co.uk/news/worldnews/piracy/3495978/Somali-piracy-Islamic-militants-attack-pirates-over-hijacked-Saudi-tanker.html. Capua, Joe. “Somalia – Security: Somali Pirates Target New Area, Adopt Tougher Tactics for Hijackings,” International News Safety Institute, August 4, 2009, http://www.newssafety.org/index.php?view=article&catid=41%3Asomalia-security&id=12657%3Asomali-pirates-target-new-area-adopt-tougher-tactics-for-hijackings&option=com_content&Itemid=100249 (accessed December 10, 2009). Clayton, Jonathon. “Somalia’s Secret Dumps of Toxic Waste Washed Ashore by Tsunami.” Times Online, March 4, 2005. http://www.timesonline.co.uk/tol/news/world/article418665.ece (accessed December 16, 2009). Crilly, Rob. “Pirates help fund Somali Warlords,” Christian Science Monitor. August 27, 2008. (accessed December 15, 2009). Dickey, Christopher. “How to Deal” Newsweek April 15, 2009. http://www.newsweek.com/id/194049 (accessed December 15, 2009). “Evaluating the Somali ‘Pirate’ Situation” Africa Faith and Justice Network. April 14, 2009. http://www.afjn.org/focus-campaigns/other/other-crisis-areas/73-somalia/625-evaluating-the-somali-qpirateq-situation.html (accessed December 16, 2009). “Fact Sheet for Supreme Islamic Courts Council,” Silobreaker, http://www.silobreaker.com/fact-sheet-for-supreme-islamic-courts-council-5_2259174231411523584_4 (accessed December 10, 2009). Gettleman, Jeffrey. “Somalia,” The New York Times, September 17, 2009. http://topics.nytimes.com/top/news/international/countriesandterritories/somalia/index.html (accessed December 10, 2009). “Global pirate attacks more frequent, violent: IMB report.” Business Times. December 18, 2009. (accessed December 18, 2009). Goodchild, Joan. “How Shipping Companies can Fight Pirates” CSO Security and Risk December 7, 2008. http://www.csoonline.com/article/469264/How_Shipping_Companies_Can_Fight_Pirates (accessed December 18, 2009). Harper, Mary.“Chasing the Somali Piracy Money Trail,” BBC News, May 24, 2009, http://news.bbc.co.uk/2/hi/africa/8061535.stm (accessed December 10, 2009). Hassan, Mohamed Olad. “It’s a Pirate’s Life for Me: Interview with Dahir Mohamed Hayeysi” BBC News, April 22, 2009. http://news.bbc.co.uk/2/hi/africa/8010061.stm (accessed December 10, 2009). Hunter, Robyn. “Somali Pirates Living the High Life,” BBC News, October 28, 2008, www.news.bbc.co.uk/2/hi.africa/7650415.stm (accessed December 10, 2009). ICC International Maritime Bureau, 2009.
International Maritime Bureau, 3rd Quarter Report, 2009. Jones, Sam and Chris McGreal, “Somali Pirates Release Ukranian Arms Ship,” The Guardian, February 6, 2009. http://www.guardian.co.uk/world/2009/feb/05/somali-pirates-free-military-ship (accessed December 10, 2009). Lawinski, Jennifer. “Enemies of All Mankind: Who Can Stop the Pirates?” Fox News April 9, 2009. http://www.foxnews.com/story/0,2933,513957,00.html (accessed December 18, 2009). Lichfield, John. “Yacht Raid Reveals Hi-Tech Somali Pirate Network,” The Independent, April 10, 2008. http://www.independent.co.uk/news/world/africa/yacht-raid-reveals-hitech-somali-pirate-network-807022.html?r=RSS (accessed December 10, 2009). Mail Foreign Service. November 18, 2009. http://www.dailymail.co.uk/news/worldnews/article-1228691/Spain-pays-2m-ransom-pirates-release-36-hostages.html (accessed December 18, 2009). “Media Attention Dramatizes Somali Piracy,” Naval History and Heritage Command Public Affairs, December 7, 2009, http://www.navy.mil/search/display.asp?story_id=50039 (accessed December 10, 2009). Murphy, Martin. Contemporary Piracy and Maritime Terrorism. International Institute for Strategic Studies. Routledge, 2007. “New Counter-Piracy Task Force Developed” United States Navy January 8, 2009. http://www.navy.mil/Search/display.asp?story_id=41687 (accessed December 18, 2009). North Atlantic Treaty Organization http://www.nato.int/issues/allied-provider/index.html April 2, 2009. Philp, Catherine. “Captured Somali pirates are being dumped in Kenya, officials say” The Times, June 12, 2009. http://www.timesonline.co.uk/tol/news/world/africa/article6481947.ece (accessed December 16, 2009). “Pirates,” GlobalSecurity.org, http://www.globalsecurity.org/military/world/para/pirates.htm (accessed December 10, 2009). 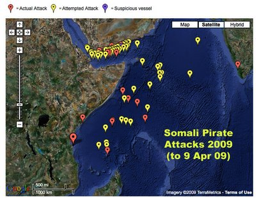 “Q&A: Somali Piracy,” BBC News, November 2, 2009, http://news.bbc.co.uk/2/hi/africa/7734985.stm (accessed December 10, 2009). Robyn Walker, “How do you pay a pirate’s ransom?” BBC News, December 3,2008, http://news.bbc.co.uk/2/hi/africa/7752813.stm (accessed December 10, 2009). Schachtman, Noah. “Exclusive Interview: Pirate on When to Negotiate, Kill the Hostages,” Wired.Com, July 28, 2009, http://www.wired.com/dangerroom/2009/07/exclusive-interview-pirate-on-when-to-negotiate-kill-hostages (accessed December 10, 2009). “Somali Pirates Get Help from Expats in Canada,” The Star, December 11, 2008, http://www.thestar.com/News/World/article/552023 (accessed December 10, 2009). “Somalia: Pirate group threatens new measures,” Somalinet, January, 26, 2006. http://somalinet.com/news/world/English/1676 (accessed December 10, 2009). “Somali Pirates Live the Good Life” CBS News, November 19, 2008, http://www.cbsnews.com/stories/2008/11/19/world/main4616998.shtml (accessed December 10, 2009). “Somali Pirates: Islamist Insurgents Demands Weapons from Hijacked Ship,” The Telegraph, October 5, 2008, http://www.telegraph.co.uk/news/worldnews/africaandindianocean/somalia/3140884/ Somali-pirates -Islamist-insurgents-demand-weapons-from-hijacked-ship.html. “Somalia,” The World Factbook 2009, Washington, DC: Central Intelligence Agency, 2009. “State Profile,” Puntland State of Somalia, http://www.puntlandgovt.com/profile.php (accessed December 10, 2009). “They Know It’s a Successful Business Model” Spiegel Online, April 21, 2009, http://www.spiegel.de/international/world/0,1518,620292,00.html (accessed December 10, 2009). Tremlett, Giles. “Somali Pirates Guided by London Intelligence Team, Report Says,” The Guardian, May 11, 2009, http://www.guardian.co.uk/world/2009/may/11/somali-pirates-london-intelligence (accessed December 10, 2009). Walker, Rob. “Inside Story of Somali Pirate Attack” BBC News, June 4, 2009. http://news.bbc.co.uk/2/hi/africa/8080098.stm (accessed December 10, 2009). Wallis, Daniel. “Somali Sea Gangs Lure Investors at Piracy Lair,” Reuters, December 1, 2009, http://www.reuters.com/article/idUSTRE5B01Z920091201?sp=true (accessed December 10, 2009). Weiser, Benjamin. “Somali Piracy Suspect Pleads Not Guilty,” The New York Times, May 21,2009, http://cityroom.blogs.nytimes.com/2009/05/21/somali-piracy-suspect-pleads-not-guilty. (accessed December 10, 2009). “What’s going on with Ecuador’s Police?” Global Integrity Commons, April 30, 2009. http://commons.globalintegrity.org/2009/04/whats-going-on-with-ecuadors-police.html (accessed December 15, 2009). World Food Program. http://www.wfp.org/countries/Somalia (accessed December 18, 2009). This entry was posted in Backgrounders, Past Student Work, Piracy, Violent Non State Actors and tagged Horn of Africa, North and Central Africa, Somalia by Administrator. Bookmark the permalink.